Thank you and all the other people in ‘SOS’ for sending all of us Christmas boxes last year. 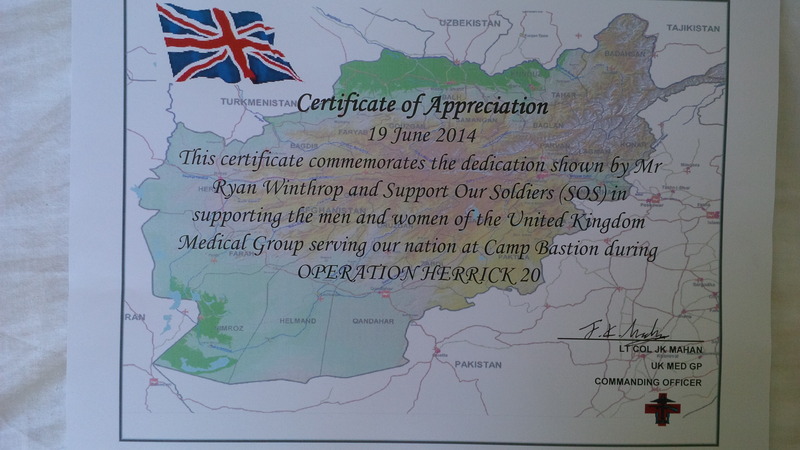 I received mine on Christmas morning along with the other British personnel out here in Kabul. It was a nice surprise to open a box full of British food and other treats. The majority of the people that we are working with out here are American, which tends to dictate the type of food that is available on the base! I am currently out in Kabul as part of the NATO mission, now called Resolute Support, which will remain in Afghanistan for at least the next two years in order to train, advise and assist the Afghan Army and Police. I will be coming home in March at the end of my six month deployment and handing over to another British Army officer. Kabul is a bustling city of some four million people, with more than its fair share of poverty, corruption and pollution! The last time that I was in Kabul was twelve years ago and I have to say that the situation is now very much better than it was Bach then. 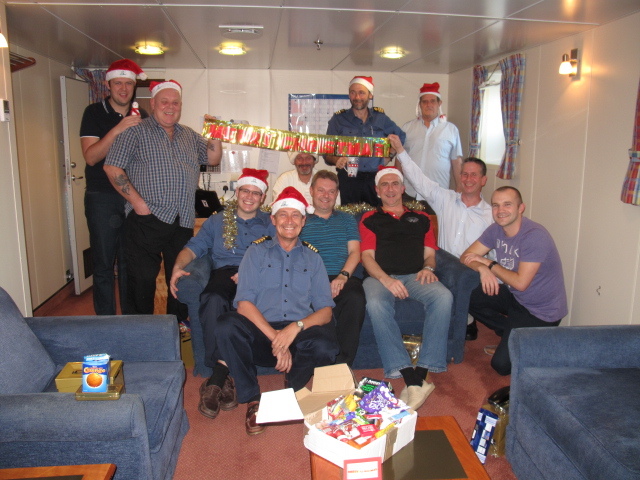 Please pass on my thanks to everyone back in the UK who was involved in putting the Christmas boxes together and sending them out to us, and a happy new year to you all. 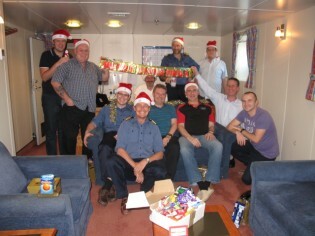 A quick note of thanks for the kind donations of goodie boxes received this Christmas to you and all concerned. The boxes do make a difference to us all away from Family and Friends at this time of year and it is lovely to think that we are being though of whilst are away doing our bit. From all the Engineering Team of Fort Austin were your efforts were much appreciated thank you. Hello I am a serving soldier in Afghanistan , I’m a royal engineer and I have been receiving your parcels and would just like to say thank you very much , they certainly do make a difference. 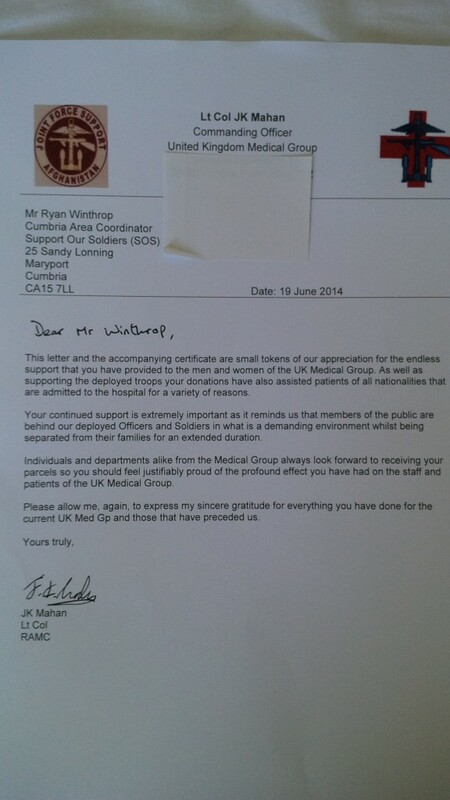 Thank you for all your support.